1 tin cannellini beans rinsed and drained. ADD the cauliflower florets and the 2 cloves of garlic and let them cook for 5-10 minutes. REMOVE with a slotted spoon the cauliflower and garlic and place to one side retaining the boiling water for later. BLITZ in a kitchen blender the cooked cauliflower, garlic and drained cannellini beans until a creamy consistency. REMOVE now a little puree sauce if feeding your baby and to the rest add the cup of milk and season with salt and pepper. BRING the cauliflower water back up to a boil and cook your pasta to just under the recommended time throwing in the frozen peas for the last 5 minutes. 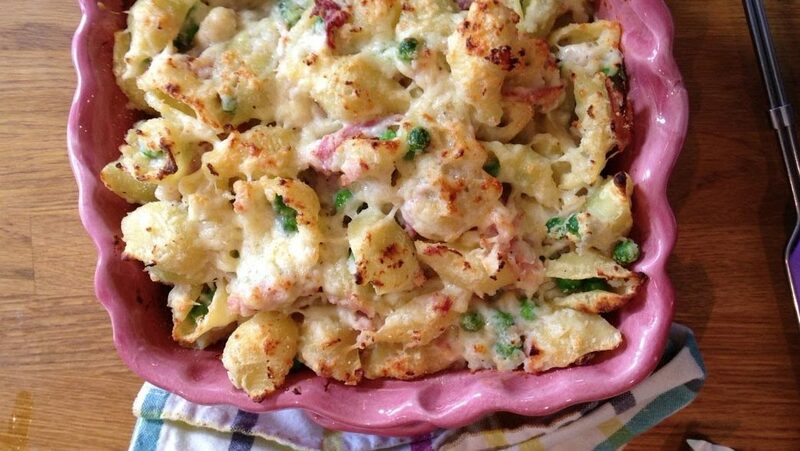 DRAIN the pasta and peas together and place in a large oven proof gratin dish. ADD the creamy bean sauce, chopped ham and grated cheddar cheese tossing to combine. SPRINKLE with the remaining cheese and dot with the butter. BAKE in a hot oven until bubbly and golden brown on top, 7 to 10 minutes.